Replacing the text in many files by hand is a tedious and error-prone task. Everybody can miss some file and get inconsistent results. 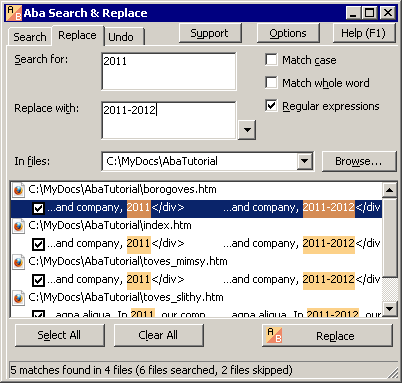 Aba Search and Replace solves this problem by replacing the text automatically. At the same time, the program shows you the occurrences that will be replaced, so you can be sure that you will not replace something that you did not mean to. In this tutorial, you will learn how to replace the copyright notice on John Smith's website. We prepared the sample files for you, so you can play with them and learn how to use the program without any risk of damaging your real documents. This tutorial will take about 5 minutes. After completing it, you will be able to use Aba for simple day-to-day tasks. If you chose not to copy tutorial files during installation, please reinstall the program. Step 2. Type 2011. The program will immediately start to search your files as you type the digits. In some cases, you even don't have to type the whole word: the first few letters are enough. But now, enter all four digits. Switch to Search tab. The results pane lists all occurrences of 2011 in the chosen folder. If you click any of the occurrences, you will see the phrase in context. Step 3. Switch to the Replace tab and type 2011-2012 in the Replace with field. The results pane shows the original occurrences on the left, and the replaced ones on the right. In this example, the replacements are evident, but when you are building a complex regular expression, this feature is very useful. Step 4. The program has found one occurrence that you don't want to replace: In 2011, our company... There are two ways to correct this. 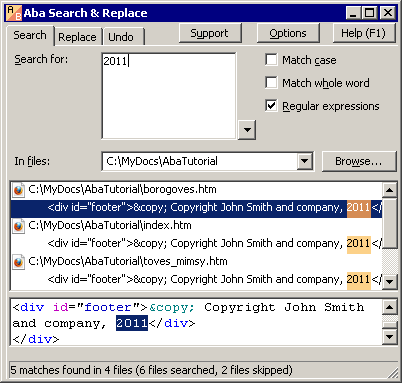 First, you could enter a longer phrase to search, e.g., John Smith and company, 2011. Second, you could manually skip the occurrences that you don't want to replace. Let's choose the lazy way :). To skip the unwanted occurrence, uncheck the box near it. Step 5. Now press the Replace button in the bottom right corner of the window. 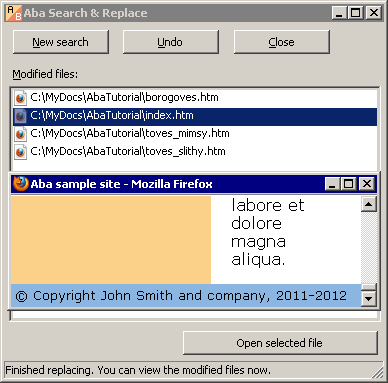 Aba will replace the copyright notice and show you the list of modified files. You can double-click a file to open it in your browser and make sure that the copyright notice was successfully changed. 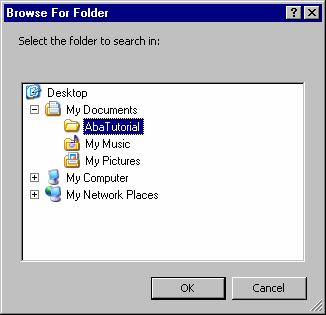 If you are satisfied with the results, you can press New search to replace something else, or Close to exit Aba. If something went wrong, you should undo the last replacement, then correct the search pattern, and try again.